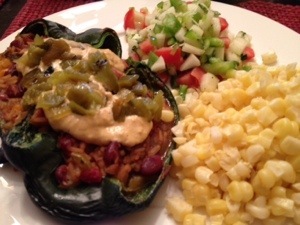 This evening we are enjoying an amazing dinner of a Poblano pepper filled with a spicy rice and bean mixture (grilled on our Big Green Egg), a faux cheese sauce made from cashews, nutritional yeast and sriracha sauce and then I added some Ortega chiles on top. We also had fresh corn from our Bountiful Baskets and a tomato/cucumber/green onion/green pepper/basil salad sprinkled with vinegar. What more can I say than Yummiferous! !